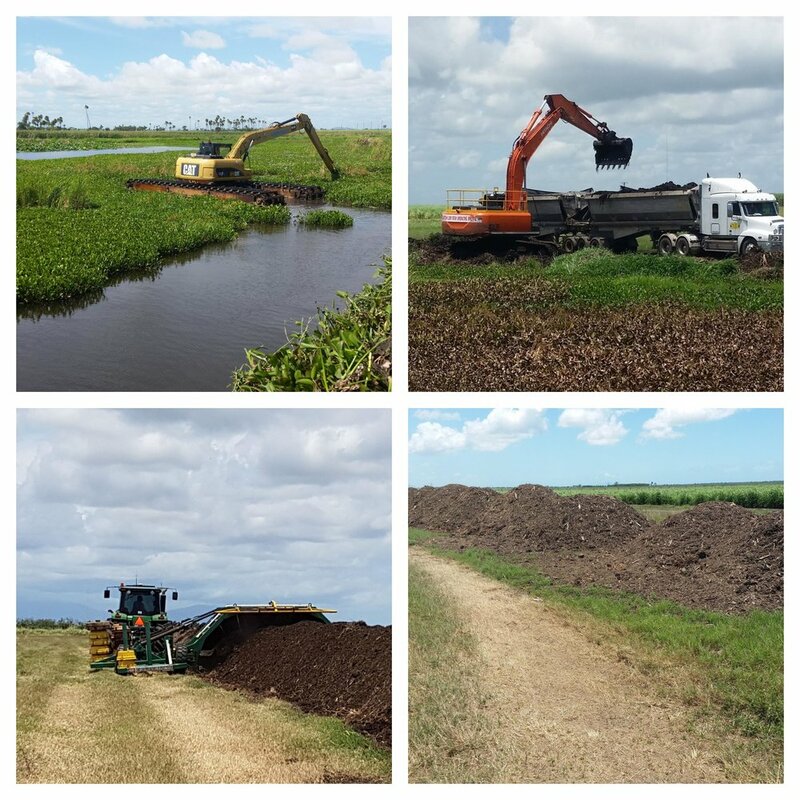 Stages of the aquatic weed removal process. NQDT expect that the bi-product of the aquatic weeds can improve both the soil carbon and its water storage capacity. This in turn would reduce the need to use synthetic fertilisers. Furthermore, clearing the weed-clogged waterway could help to encourage fish and bird life return to the area, including native species Barra and Mangrove Jack, which migrate between the ocean and their freshwater nurseries. Local landholders have expressed interest in the project and in using the compost product. “We see the value in the project and the benefits to the local environment," Burdekin Shire Mayor, Lyn McLaughlin said. Evolution Mining’s $200,000 funding partnership with NQDT enabled them to conduct a cost analysis of the project in October 2017. Evolution Mining’s Health, Safety, Environment and Community Manager, Mark Brown, said the company looked forward to a successful partnership with many shared benefits. “We’re working in partnership with NQDT to support an environmental enhancement project through our Shared Values program, which funds sustainable initiatives that benefit communities,” Mr Brown said. “Partnering with NQDT on this project will allow us to demonstrate responsible land stewardship, protect the environment, and give something back to the community,” he said. Following a rainfall event in February 2018 when the creek system received a healthy flooding, results show the project is thus far progressing well. The project team is currently targeting the removal of aquatic weeds from around the three islands that are located within the Kalamia Creek system. The main objective of this is to isolate them from wild fires. The wild fires can occur during the cane harvesting season when crops are burned to remove the leaf material which makes it easier to process in the mills. Currently wildfires can burn across the top of the water due to the weed material above the surface. Long term, consecutive fires will change the habitat structure from open woodland and coastal dry tropics rain forests into dominant palm forests. This reduces the diversity of tree species and in turn preferential habitat for animal and bird species. The composted component is continuing although cooler winter temperatures has slowed down the composting process. The project is part of NQDT’s larger Reef Rescue Systems Repair Project, funded through the Australian Government Reef Program, and has the potential to deliver significant benefits for not only the local environment and agriculture industry, but also potential tourism to the region.